← Excellent Pizza at Treeland’s Resort on the Chippewa Flowage! Last month I picked up my new bow from Shooting Star Archery & Coffee in Hayward, Wisconsin (15875 T Bone Lane, Hayward WI 54843 715-634-8880). I am now the proud owner of a Mission Craze, by Mathews. 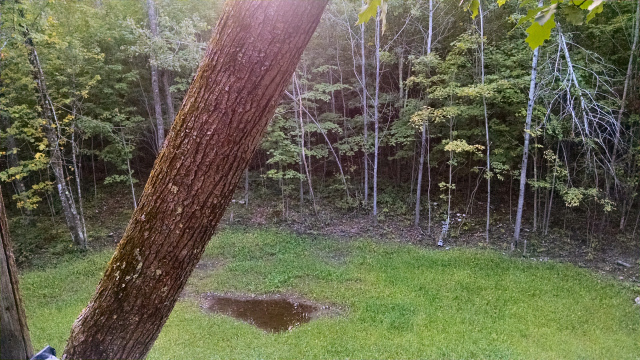 Since, I’ve been practicing from both the ground and from up in our deer stand south of Hayward. I’m getting better and better at hitting the target where I want, but I guess at this point, I’m still not Robin Hood. 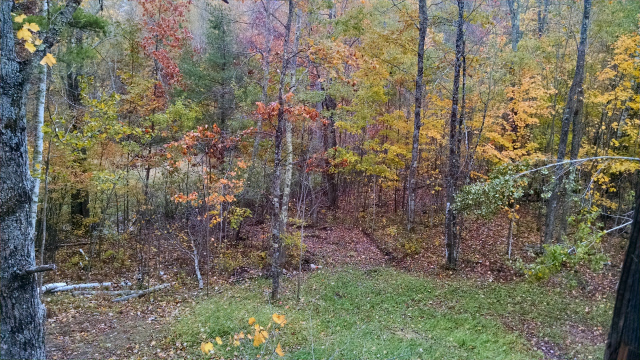 Since bow hunting opened, I’ve sat up in the deer stand most every evening until dark, and it amazes me how the forest changes from day to day! I remember how dense the woods looked during mid-September; one could hardly see beyond the wall of trees bordering the food plot. The does would just suddenly appear out of nowhere then – moving silently through the still-green forest floor and out into the open space to pick at the greens. Daily I watched the leaves change from their faded-fall greens to the bright reds and yellows, to finally the pale oranges and burnt rust colors. 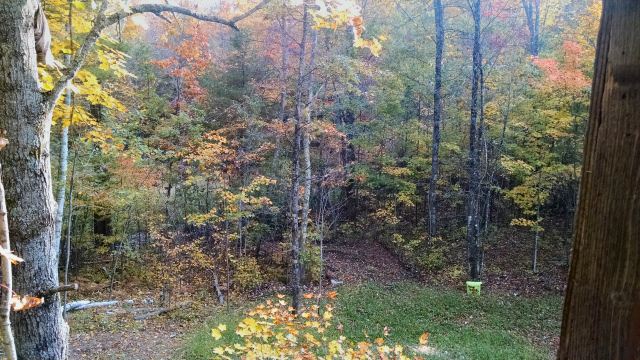 The crisp fall temperatures and constant wind created a daily fresh blanket of crunchy leaves on the once-bare trail. I could see deeper into the forest with each passing day. As October arrived I could finally see and hear the deer moving in on the food plot-no matter how hard they try to be stealthy, the crunching leaves give them away. It took me a while to decipher the sounds in the forest though; the sparrows create a fracas as they pick through leaves on the forest floor, and the many chipmunks, gray and black squirrels, with their sudden scurrying about, can make you think a whole herd is heading your way! Bluejays seem to dominate the landscape here – I’ve seen as many as a half dozen of these clammoring birds hanging around the foot plot trees. One of the most startling noises I’ve heard comes from a big owl. I’ve never seen it but it must be very close to me, because when he decides to hoot, it nearly blasts me off my seat in the tree stand. About the only sound I don’t like to hear is ‘crashing’ through the branches – as this usually means the bears are back for a visit. 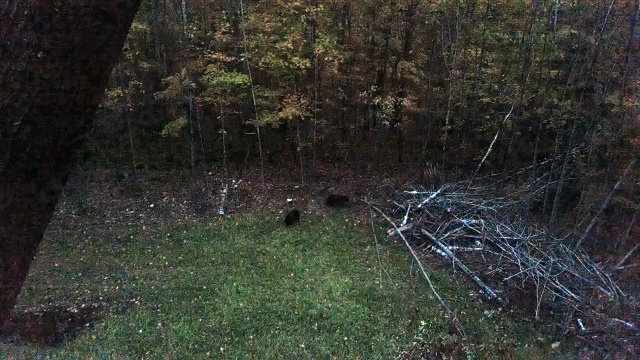 I was closing up the tree stand at dusk the other night when suddenly I hear breaking branches and heavy crunching. Out the west window I see three cubs wandering through the food plat, each sitting up and sniffing the air towards me. Suddenly, a huge sow appears behind them, and they are all heading towards my tree stand despite the noise I was making to try to scare them off! Finally they set off – and I was thankful they went in the direction opposite from my trail back to the car. As the days tick by, I’ve been seeing more and more deer wandering through the area – all does so far, but we are seeing some smaller buck on trailcam. 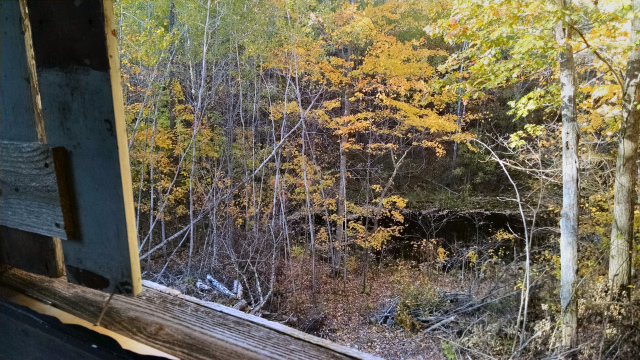 I continue to enjoy the woods and wilderness while waiting for that nice buck to come my way………. This entry was posted in Hunting, NORTHWOODS LIFE, Scenic Observations and tagged bluejays in hayward wi, bow hunting, bow hunting hayward wi, cathy lareau realtor, deer hunting hayward wi, mission craze bow, mission craze by mathews, northern wi wildlife, northwoods in hayward wi, owls in hayward wi. Bookmark the permalink.